Pad Thai has its origins after World War II, when immigrants from China introduced rice noodles to many southern Asian countries. During the post-war recession, the Thai government encouraged the production of rice noodles and the construction of noodle shops. 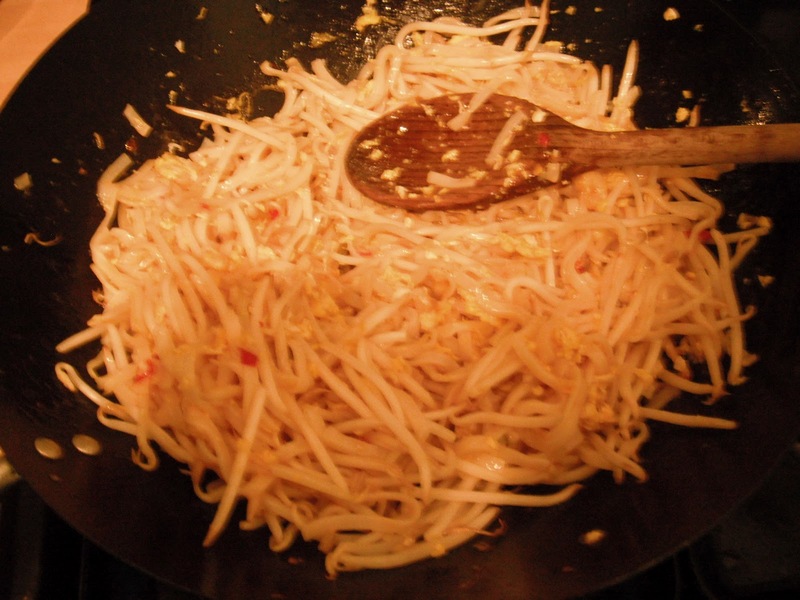 This led to many styles of rice noodles in Thailand, including Pad Thai. 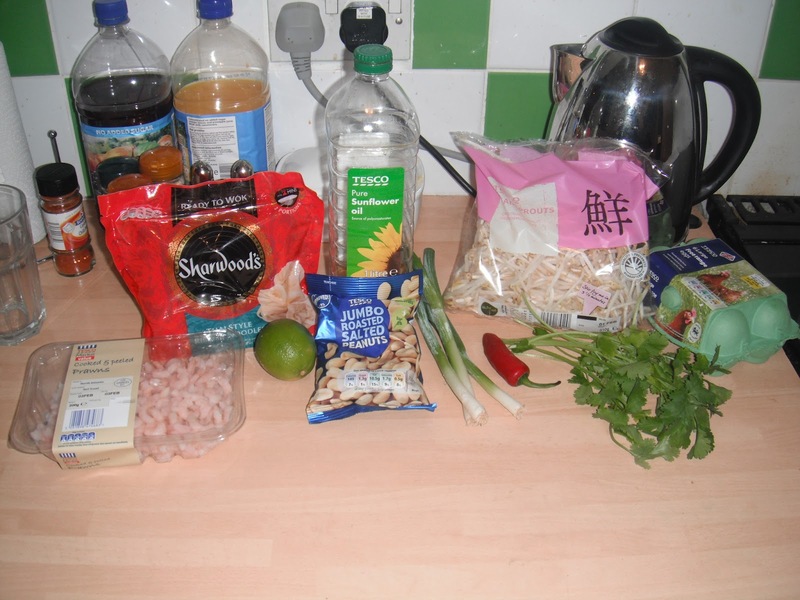 I used a bottle of Pad Thai sauce because I don't like to spend my life making sauces with extra ingredients, but if you like you can make your own sauce using these ingredients. Just mix it all in a bowl until the sugar dissolves and then set it aside for later in the recipe. First, soak your rice noodles in cold water for an hour, then drain them. They should be firm and still very chewy at this point. 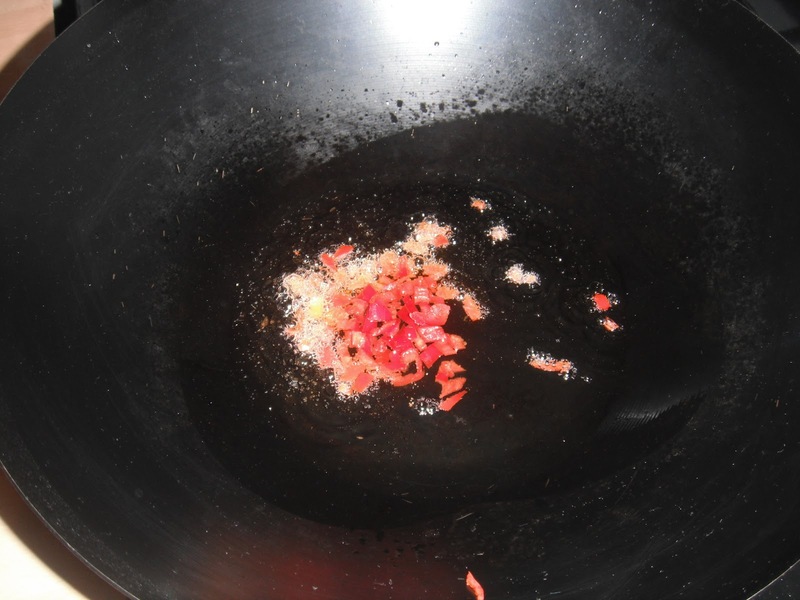 Put two tablespoons of oil in the wok on medium-high heat, and stir-fry the chilies until they give off their fragrance, which should take about one minute. I bought a bag of mixed chilies, which turned out to be about a hundred green chilis and one single red chili, which is why there's only a tiny amount in the wok here. I'd recommend two or three chilis instead, if you like chilis. Add in your prawns. I've used small prawns here, but you can use large ones or even jumbo ones if that suits your fancy. Fry them until they're pink, which should take a minute or two. 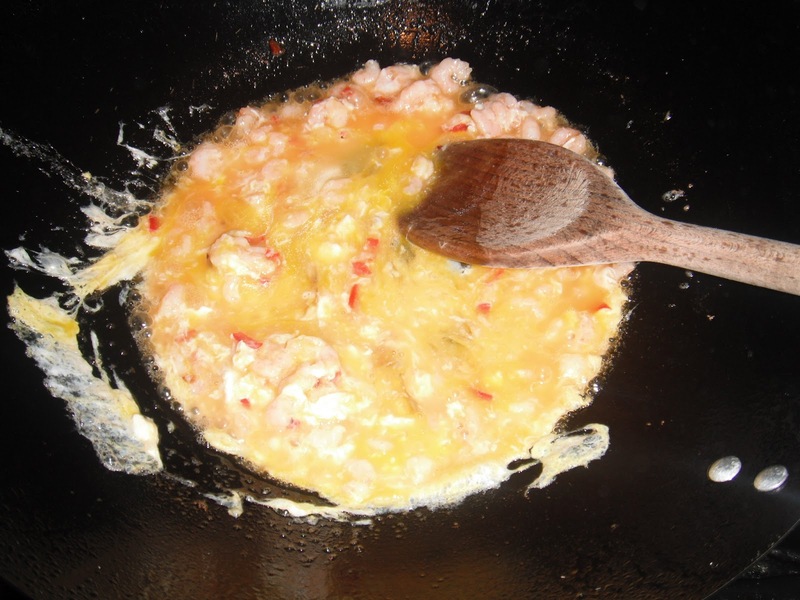 Crack the eggs into the pan and give them a good mixing, scrambling, stir-fry until they're cooked. The eggs will most likely have soaked up the oil, so add the rest of your oil and spread it around to moisten the pan. 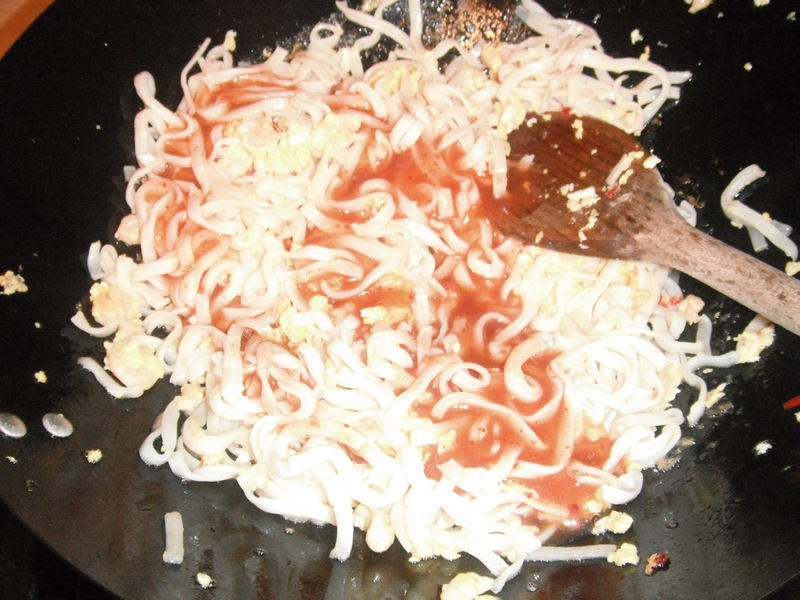 Now add your noodles, and as you stir fry them, drizzle the sauce in so it coats them. Lift and turn the noodles - very gently, or they may will break up - so the ingredients combine more effectively, and continue to stir fry for another 1-2 minutes. 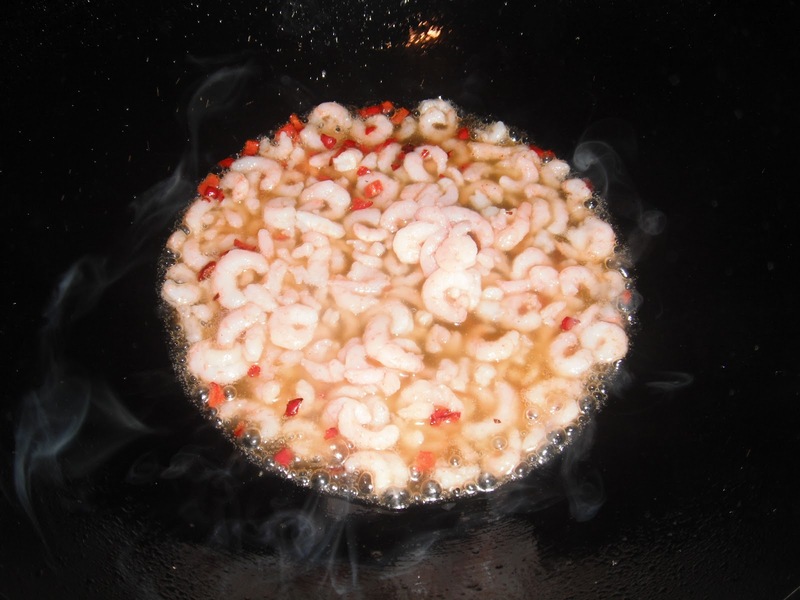 Your wok may have dried again, and if so you will need to add another tablespoon of oil. Go ahead and add the bean sprouts, stir frying them in with the noodles. The noodles are done when they are soft, but still chewy. If they're still too hard at this point, stir fry them for a little longer on medium heat. Once they're done, remove them from the heat immediately and serve them. Sprinkle them with spring onions, coriander, peanuts and fresh lime juice. 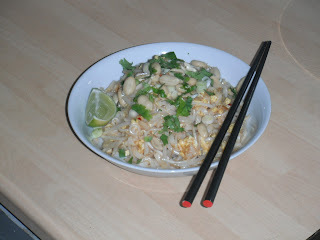 The Pad Thai looked really nice, and so I was especially disappointed by the bland taste. I squeezed an additional lime slice onto it for more flavor, which helped a bit. The rice noodles had a texture which is far different from egg or flour noodles. They feel very nice in your mouth, very chewy. I'd like to try the noodles in different ways with stronger sauces to give them another chance. The bean sprouts also had a nice texture, but not much taste. I was suprised by the eggs, which cooked into tiny fluffy bits and also added another pleasing texture. Overall, the whole dish had great texture but almost no taste.